The City collection is created using metal sheets of different sizes and mounting them together to create a unique shape. To add movement and different rays of light the frame is enforced by hand blown glass inserts. 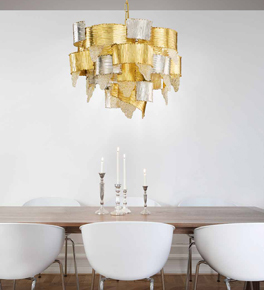 This collection includes chandeliers, wall lights and pendants.